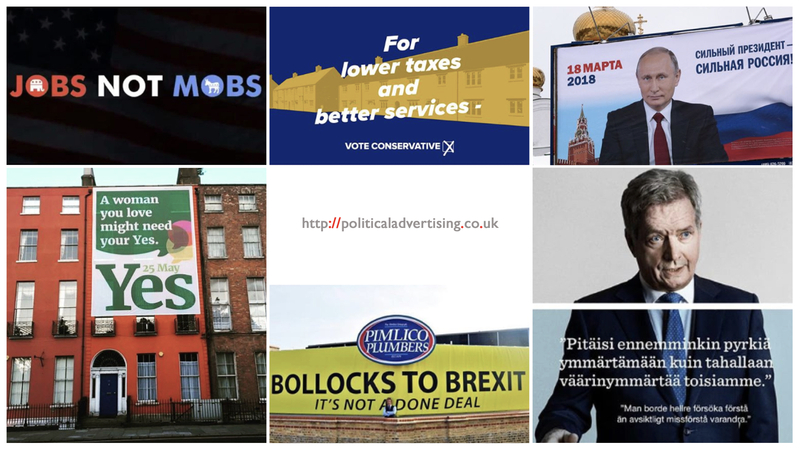 Welcome to the politicaladvertising.co.uk campaign awards 2018! This year we’ve had some fascinating electoral contests; from populist parties fighting for primacy in Italy to Democrats and Republicans going head-to-head in the midterms in the USA. And there have been some brutal battles over big issues; Brexit dominated discourse in the UK, abortion rights took centre-stage in Ireland and immigration continues to shape debate on every continent. Political advertising itself has also been a hot topic; the Cambridge Analytica scandal and Russian information wars both centred around the use of advertising during elections, which prompted a public discussion around issues relating to privacy, transparency and accountability of campaigns. All of this juicy subject matter means that there has been some phenomenal political advertising that is in dire need of celebration. The award categories are: best poster, best online video, best TV ad, best campaign branding, worst backfire and overall campaign of the year. No jurors were invited to bicker over who should win, no sponsors were offered the opportunity of presenting an award and members of the general public were kept as far away from the process as was possible. On 25th May there was a referendum on abortion law in Ireland. Abortion is an issue which encourages extremely strong emotional responses and the ethical and clinical arguments can be very complex. This poster didn’t try and deal with the moral rights and wrongs of the topic, instead, the campaign used carefully chosen and quietly persuasive words to play to humans’ instinctive desire for privacy and control. Winner: Rang-tan: the story of dirty palm oil for Greenpeace by Mother London. Powerful storytelling, beautiful writing and some lovely animation combine to make a highly emotive film highlighting the damage that palm oil manufacturing can have on rainforests and their inhabitants. The film went viral in the UK when frozen food retailer Iceland claimed they were “banned” from using it as their Christmas TV ad due to regulations preventing political ads running on TV. The advert draws a humorous analogy between Phillips’opponent – who was the incumbent – and a mythical beast: rarely seen in office and always up to no good. The writing is brilliant and the comic delivery of the actor playing Bigfoot is superb. Beto O’Rourke’s campaign branding was distinctive and felt authentic. He had the confidence to use only his first (slightly unusual) name. He bought a simple, well-crafted logo which broke from Democrat convention (it’s not blue). And he developed this sort of ‘woke suburban dad’ vibe around his candidacy which was very different to his opponent – Ted Cruz – who can come across as a massive reactionary nerd. On the day before the second largest protest in British history – which called for a referendum on the terms of the Brexit deal – the hard Brexit group Leave Means Leave ran this childish rant of a press ad. It was widely seen as depressingly amateur and sapped the confidence of those still fighting in favour of EU withdrawal. Together for Yes, the pro-choice campaign in Ireland’s referendum on abortion, faced an uphill battle. First consider that all the polling showed that older, more rural, more religious, less educated and less well-off people were more likely to be anti-abortion. Then know, that in the 2016 Irish census 78.3% of the population identified as Catholic and that Ireland’s population is one of most rural inthe EU; rural dwellers account for 42% of the population (compared to anaverage of 27% in EU and 12% in Britain). And yet the Yes campaign won in every region of Ireland – amongst both men and women – and in every age group below 65. Together for Yes had a simple strategy which they stuck to: positioning the referendum not as a choice between whether you agree with abortion or not, but instead as a vote on who should decide if someone can have one and whether those who choose to do so can carry it out safely. They successfully used an adult, compassionate and progressive tone to bring lots of different groups on board and in doing so managed to build a sense that history was on their side.